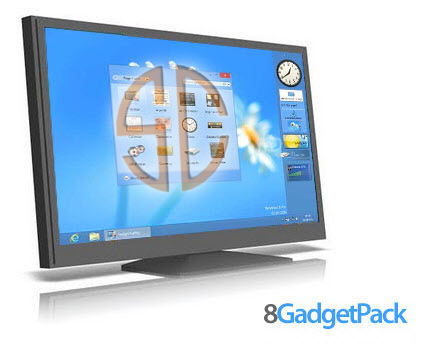 8GadgetPack is a tool that will help restore the usual gadgets on the desktop in Windows 8, which will help you quickly get the information (clock, calendar, weather, currency exchange rates, system, and so on). Gadgets are installed in the same simple way as before. Included with the program are 45 gadgets (official from Microsoft, as well as the most popular), also included is a gadget 7 Sidebar, which simulates a sidebar gadget Windows Vista. The program has a set of standard and some additional gadgets, and also supports the installation of new ones. Extras. information: After installation is complete, you’ll see a gadget on the right side of the desktop with a clock gadget to work with the clipboard and the weather. After the first run the application is automatically downloaded to the panel developer gadget “7 Sidebar”. It can be configured to your liking, or disable the. If the tab “Design” uncheck “Enable Aero Glass”, the side of the background is transparent. * Resolved a bug preventing the gadgets to start. * Updated a lot of gadgets and added a few. * Improved install time and installer compression.